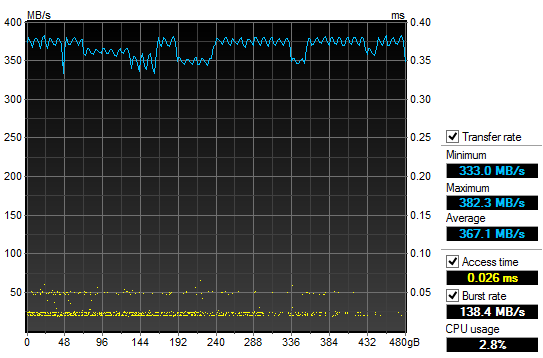 The next benchmark is HD Tune Pro 4.60, which does not provide us with any fancy generated graphs. Instead, we have to take a screenshot and edit a few parts out to make it look pretty on our website. Much like our past experience with HD Tune, the produced graph trends flat, but is decreased in magnitude in comparison to HD Tach. This is likely due to the difference in testing algorithms. Otherwise, these results were as we would expect, especially in comparison with the Ignite's other benchmark results. The only thing to note is the access time. In HD Tach, we were able to get an access time of 0.0ms. HD Tune showed the time with more precision at 0.026ms. posted 14 hours and 44 minutes ago, with 1 posts. posted 14 hours and 45 minutes ago, with 7 posts. posted 14 hours and 46 minutes ago, with 6 posts. posted 14 hours and 47 minutes ago, with 6 posts. posted 14 hours and 49 minutes ago, with 14 posts. posted 14 hours and 49 minutes ago, with 58 posts. posted 14 hours and 50 minutes ago, with 13 posts. posted 14 hours and 50 minutes ago, with 10 posts. posted 14 hours and 51 minutes ago, with 12 posts.